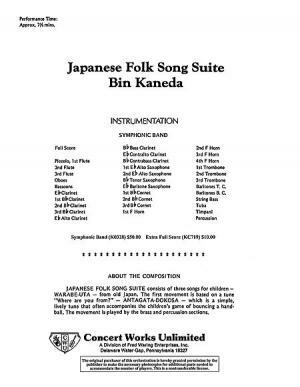 Japanese Folk Song Suite by Bin Kaneda. 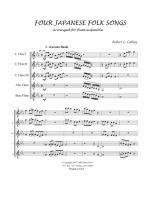 For Symphonic Band (Score & Parts). Shawnee Press. Grade 4. Shawnee Press #K0328. Published by Shawnee Press (HL.35011343). 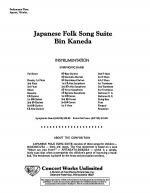 Japanese Folk Song Suite consists of three songs for children:• Warabe-Uta, or “Where Are You From?”; an ancient song• Lullaby • Antagata-Dokosa, or “An Ancient Priest in a Mountain Temple”; a simple, lively tune that often accompanies the children's game of bouncing a handball.